With a title like The Haunted Hotel, you can be forgiven if you expect this book to be a ghost story, but it’s not. The books does have some dark and nasty scenes, especially towards the end of the book and—yes—there is a ghost as well, but The Haunted Hotel is more of a gothic mystery than a ghost story. 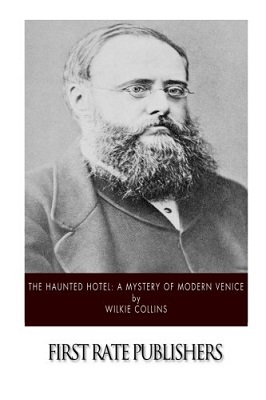 To be fair, the subtitle does state that it’s “A Mystery of Old Venice”, but in some modern copies of the book, the subtitle has been dropped. The story is set in 1860 and the heroine is a lady named Agnes Lockwood, whose fiancé; Herbert Westwick (Lord Montbarry) jilted her for the rather sinister Countess Narona. He died shortly afterward, under suspicious circumstances, while the couple was on an extended stay in Venice, accompanied by the Countess’ brother (Baron Rivar). A further mystery surrounds the disappearance of Lord Montbarry’s courier, Mr Ferrari. While in Venice, Lord Montbarry stayed—and died—in an old, decaying palace. Later in the book the palace is refurbished as a hotel. Lord Montbarry’s brother Henry has money invested in the project so, when his nephew gets married and honeymoons in Europe, it seems only natural that the newlyweds should spend a little time at the new hotel. The rest of the family agree to meet the happy couple in Venice and Agnes, now nanny to Stephen Westwick’s children, accompanies them. Several members of the Westwick family unknowingly stay in the room where Herbert Westwick died. All of them experience negative sensations in the room and when Agnes spends a night there she awakes, in the early hours of the morning, and discovers Countess Narona has sneaked into her room. One unpleasant surprise leads to another when Agnes looks up and sees a ghostly, severed head floating above her bed. The scene with the severed head is quite nasty, as are some of the scenes that follow, but I very much doubt that fans of the horror genre will find anything too shocking in The Haunted Hotel. However, readers who are used to lighter reading may be in for quite a shock. The Haunted Hotel is a little too slow moving for my taste, but it’s short enough to read in just one sitting and, although I cannot say that I loved it, I cannot say that I hated it either. Before I began reading the book, I was aware that there was a scene with a floating head somewhere amongst its pages and I was expecting quite a dark story, but the head does not appear until chapter twenty-two. Although the chapter contains some elements of horror, as does one of the following chapters, when a real head is discovered, it was a long time to wait and I think that many lovers of the dark fantastic may find The Haunted Hotel a rather disappointing read. Countess Narona is an interesting character though. She is also one of the strongest characters in the book, but her character changes considerably as the story progresses. She is introduced in the first chapter, as a mysterious patient in a doctor’s office, who is seeking reassurance because she fears she may be going mad. In subsequent chapters her character becomes much darker. She is evil—a force to be reckoned with, who oozes bad karma. Then, when she returns to Venice to accept whatever fate destiny has lined up for her, the Countess’ personality seems much weaker; she finally loses her mind after all and reveals the truth about her husband’s death. The way the Countess makes her revelation is a disappointment, to say the least. I was hoping for a big climax, but it was more of a fizzling out. The book does have a happy ending though—so if you like happy endings you will not be disappointed. If you usually read horror stories you may want to try elsewhere. A few chapters of nasty, right near the end of the book do not a horror story make.